Life Music Laughter: Lucas Films and HP Join Forces To Celebrate Star Wars and Art with Art Awakens! 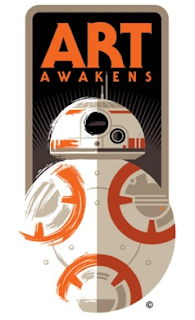 Plus, coming this November to Gallery 1988 in Los Angeles is a three-day Star Wars: The Force Awakens art exhibit featuring top professional and emerging contemporary artists. All new original pieces will be auctioned off in the name of Star Wars: Force for Change to benefit UNICEF Kid Power, which gives kids the power to save lives. By getting active with the UNICEF Kid Power band, kids earn points which unlock food packets for malnourished children around the world. Five lucky winners of the Star Wars: The Force Awakens Fan Art Contest, chosen by a judging committee that includes members from Disney, Lucasfilm and the legendary visual effects house Industrial Light & Magic and others, will have their art showcased in the professional gallery exhibit. How cool is that! So, go to ArtAwakens.com for offical rules. Follow #ArtAwakens to see all the updates. Disclosure: I was not compensated for this post. Opinions expressed are my own.